Here's a paper I wrote in February 2012 for my Computing for Communications class on Photoshop and ethical boundaries. The use of Photoshop to edit and ‘enhance’ images is controversial to say the least. As activists hold a magnifying glass (sometimes literally) against these images in order to investigate how and to what extent reality is being altered, we are faced with the question: Do these images affect us in a negative way and if so, what should we do about it? Complexion is not the only thing being digitally altered, however, bodies are also put ‘under the knife’ of the Photoshop experts – and sometimes to a frightening extent. I suppose it’s not enough to ‘shave off’ some flab; now we need to remove body parts. Where does it end? The truth is eating disorders are mental illnesses that cannot, in my opinion, be caused by looking at an image of a model who’s been digitally ‘downsized’ to size 0. There are many emotional, psychological, and biological factors that contribute to one’s likelihood of developing an eating disorder, and by blaming media images we run the risk of ‘simplifying’ the complexity of these issues, which in turn could negatively affect the route one takes in order to recover from them. 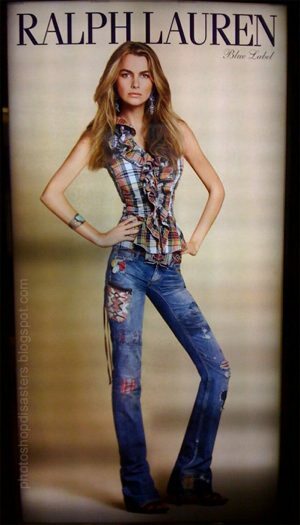 That being said, photo shopped images can influence negative body image and hence may contribute to disordered eating or ‘fuel the flame’ to an individual’s already existent eating disorder. In addition, these images alter our social norms and desensitize us to images of bodies that are unhealthy, and therefore lead us to believe that these digitally-generated bodies and faces are achievable and something we should aspire to. “Adam Levine Vogue Russia,” found at http://i.dailymail.co.uk/i/pix/2011/10/17/article-2050099-0E6A5A7100000578-412_634x821.jpg. Last accessed on February 25, 2012. “Kristen Stewart Glamour Magazine,” found at http://i.dailymail.co.uk/i/pix/2011/10/17/article-2050099-0E3F4A4F00000578-458_634x851.jpg. Last accessed on February 25, 2012. “Ralph Lauren Ad,” found at http://www.boingboing.net/2009/09/29/lauren.jpg. Last accessed on February 25, 2012.